Little Girl Played with an iPad. She Got Her Teeth Knocked Out. Scrolling and swiping. 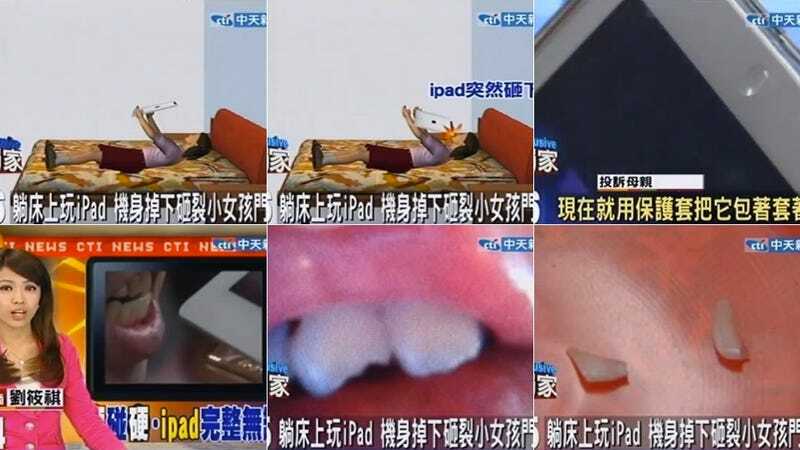 Flat on her back, a young girl in Taiwan was playing with an iPad on her bed. When she got tired, the iPad slipped out of her hand and hit the girl in the mouth. The corner of the iPad hit her front teeth, causing them to chip. Cracked smile aside, the little girl is okay, and the girl's mother purchased a rubberized iPad cover. Because getting hit in the mouth with that isn't as bad? Sit up straight when you use the iPad, kids!